Bostock was a founding member of the Sydney Camera Circle in 1916. He became a member of the Royal Photographic Society in London while overseas on war service and on his return to Sydney in 1920 he set up as a photographer specialising in photographic work for advertising and industry. He was also a skilled craftsman in bookbinding (as his father had been). He edited and designed the catalogues for his fellow pictorialists and remained a member of the Camera Circle until the end of 1935. However, he was always somewhat eccentric in his photography in comparison to the dominant soft-focus style. His work was usually more direct and his interest in form and abstraction was clear from the early 1930s. He joined the independent Contemporary Camera Groupe and exhibited with them in 1938. He also supported Dupain in his early experimentation. 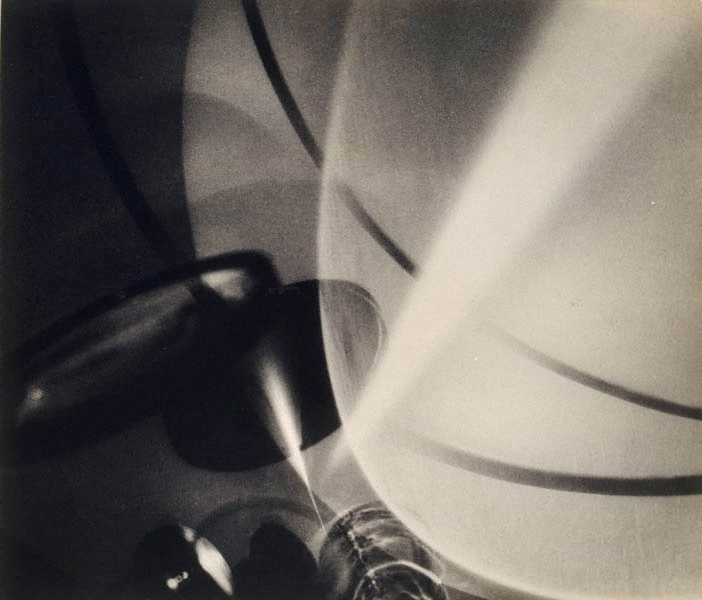 ‘Phenomena’ was one of 11 photographs Bostock exhibited with the Contemporary Camera Groupe and it was placed in the window at David Jones along with other photographs such as ‘Plum blossom’ 1937 by Olive Cotton and ‘Mechanisation of art’ by Laurence Le Guay. ‘Phenomena’ is a wonderful modernist work with its plays of light and dark and disorienting shapes and curving lines. It is impossible to tell exactly how the shapes are made or where the light is coming from, nor what the objects are. It could easily be exhibited upside down 2 where the viewer could be looking down on objects arranged on a flat surface. ‘Phenomena’ is a tribute to Bostock’s restless, inventive and exacting abilities. Signed c. verso, ink "Cecil W Bostock". Not dated. Judy Annear, Photography: Art Gallery of New South Wales Collection , 'Australian modernism', pg.131-149, Sydney, 2007, frontispiece (illus. ), 144 (illus.). Denise Mimmocchi, Sydney moderns: art for a new world , 'Still-life as laboratory table', pg.198-213, Sydney, 2013, 203, 212 (illus.). In our own image: the story of Australian art , 'The Modern Artist 1913-1940', pg.89-115, Sydney, 2002, 108 (illus.). AGNSW Collections , 'From Colonialism to late Modernism', pg. 7-106, Sydney, 1994, 40 (illus. ).